CARY, N.C. — Taylor Otto vividly remembers the first day she came to North Carolina to meet coach Anson Dorrance. Just 13 years old, Otto wasn’t sure what she was looking for in a college program, but, following the advice of her club coach, she took a visit to Chapel Hill. Dorrance was ready. He pulled out his national championship rings — and Otto was hooked. Seven years later, Otto is only one game away from earning a ring of her own, as North Carolina plays Florida State at 1 p.m. ET Sunday for the national championship. But she’ll have to get through the Florida State defense, one that shut out the defending national champions just two nights earlier, if she wants to help bring her dream full circle. 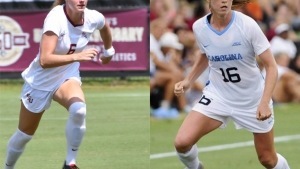 Both the Seminoles and the Tar Heels boast a long history of soccer success, with North Carolina playing in its 37th consecutive tournament and Florida State in its 19th consecutive tournament. The Tar Heels hold 21 NCAA titles in women’s soccer, and it’s this success that inspired Otto to join the Carolina team. The Seminoles, however, are the more recent champions, taking home the national title in 2014 while Carolina has not won a championship since 2012. The College Cup final will be a matchup between the two teams looking to add to their tradition of success and two ACC teams looking to solidify themselves as the best team in the country. Who is the most dominant offensive player in the game? Florida State has six players who have scored double-digit points this year including Deyna Castellanos, Yujie Zhao, Dallas Dorosy, Kristen McFarland, Anna Patten and Kristina Lynch. Castellanos leads the team with 10 goals, seven assists and 27 points while Zhao and Dorosy round out the top three in Seminole leaderboard with 19 and 14 points respectively. Of Dorosy’s 14 points, nine of those have come in ACC tournament and NCAA tournament play, making her a dangerous threat to the Tar Heels. Senior captain and semifinal game-winning goal scorer Julia Ashley leads the Tar Heels, and she is one of eight North Carolina players with over 10 points this season. This balanced offense, and the strong leadership of Ashley, Otto and senior Annie Kingman, has helped the Tar Heels make their deep run in the postseason, and they are hoping for just one more win this year. Last year’s senior class was the first time a North Carolina group graduated without earning a championship ring. Ashley said in the press conference that she does not want to be part of the second senior class to go ringless. Who has the advantage if the game goes into extra time? Florida State settled its game with Stanford easily in the first half, but if this game is tied at the end of the first half, or even at the end of the second half, the Tar Heels and the Seminoles will be ready. North Carolina played deep into double overtime against Georgetown, and Dorrance said that as time passed, his team found a better rhythm and starting playing more effectively. “As the game wore on, we got better and better, and more and more determined. I really felt the longer the game wore on, the more in control of that game we were, and that’s certainly a credit again to my leadership,” Dorrance said. Similarly, Florida State has shown throughout this tournament that its team is comfortable finding chances late in the second half, as five of the eight goals Florida State has scored in this tournament have come in the second half. Two of those games, against South Florida and Southern California, required Florida State to stage a come-from-behind effort to pull out the win, but both times the Seminoles found success. The defense has not given up a single second-half goal all tournament and gave up only six second-half goals the entire season. For North Carolina, this means one thing: score early. What do we know about the goalkeepers? For most of the season, Florida State started freshman goalkeeper Brooke Bollinger as part of its team of five freshman starters. Bollinger, however, went down with an injury against North Carolina in the ACC tournament, forcing Florida State head coach Mark Krikorian to make a change. Enter redshirt junior Caroline Jeffers, a backup who played in just two regular season games this year but has only let up two goals since stepping in between the posts. She’s proven her ability to handle a penalty kick situation, helping Florida State sneak past South California in penalty kicks earlier this season. She also helped shut out Stanford on Friday night, and now she will compete in her first College Cup final against the most successful team in women’s college soccer history. One big family playing for one big trophy tomorrow. On the North Carolina side, senior Samantha Leshnak has proven her consistency and reliability in goal over her four years as a Tar Heel. From August 22 to November 4 this season, Leshnak did not concede a single goal, a individual scoreless streak that solidifies her name in Tar Heel history and makes her the only goalkeeper to have held off teams for that long of period. The team to break her streak? Florida State’s Dallas Dorosy off a pass from Seminole freshman Jaelin Howell. The duo is back, and they will aim to put the ball past Leshnak again. Leshnak’s experience will benefit her in this high-pressure game, but will it be enough to stop Florida State from taking down the Tar Heels at WakeMed again? These two teams will face off at 1 p.m. ET in what promises to be a competitive, intense battle for at least 90 minutes. Will Taylor Otto earn that title she’s sought for so long? Her chance is now. Next Article The CFP selections are in, who's still in the hunt for a National Championship?